해외 여행, 해외봉사, 해외인턴십, 어학연수, 취업, 유학 등 여러 가지 방법으로 예전보다 해외에 거주할 기회가 많고, 외국인과 꾸준히 교류하는 기회가 점점 더 많아지고 있는데요. 해외에 직접 나가지 않더라도 학교, 어학원, SNS, 온라인 해외 서클 등을 통해서도 외국인과 친분을 쌓아가기도 하지요. 상대방과 인간관계를 꾸준히 유지할 수 있는 방법 중 하나는 상대방의 생일을 잊지 않고 챙겨주는 일인데요. 상대방을 늘 기억하고 있다는 자신의 진심을 자연스럽게 표현할 수 있는 가장 쉬운 방법 중 하나인 것 같아요. 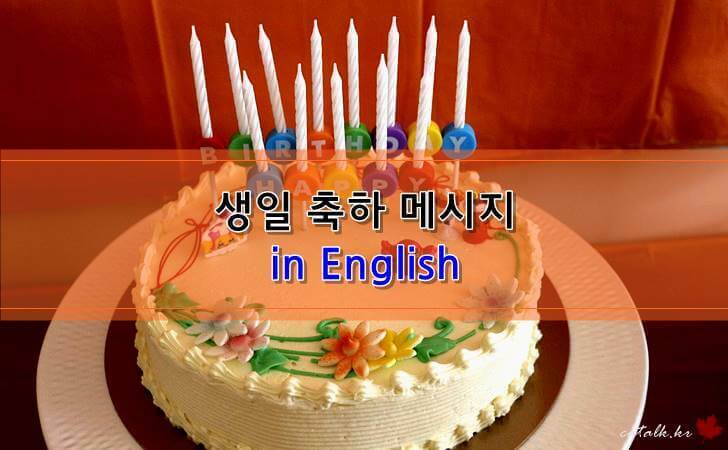 그래서 오늘은 영어로 전하는 생일 축하 메시지를 정리해보았습니다. May your heart be happy and warm May you have success and delight May you be unbreakable and strong May you always win in every fight. You can learn how to fly, even if it takes a while. Happy birthday to you and always wear your smile! On your birthday I wish you much pleasure and joy. I hope all of your wishes come true. May each hour and minute be filled with delight. HAPPY BIRTHDAY! Sending birthday blessings filled with love, peace and joy. Wishing sweetest things happen right before your eyes! Sending you warm wishes and lots of love on your birthday. May you have a wonderful time. Happy birthday! Thanks for all the love, care, time and attention you have given me. I hope that our relationship will last forever and you may have a great birthday. Happy Birthday! On your special day, I want to tell you how much I appreciate everything you do for me. You make me the happiest person in the world. Happy Birthday! Thank you for teaching me, it was a great pleasure to be your student, I wish you a wonderful birthday, lots of laughter, happiness and joy! Happy birthday, dearest teacher! Thank you for your amazing energy and your special ability to light up even the dullest days! Happy birthday to our coolest teacher. No words can express all the respect and admiration that we have for you! I am endlessly grateful for your constant support and encouragement! Happy birthday to my favourite teacher! Happy birthday to our amazing teacher! We are so grateful for all your enthusiasm and encouragement! Happy birthday my friend! Best of wishes for you, Have a great day, I hope your every wish comes true. You are always there for me, supporting me, encouraging me, listening to me and all those other things that friends do. Happy Birthday, My Wonderful Friend! Today is one of my favorite days. On this day a wonderful person came on earth. For me you are like the sun rays. Happy birthday and I Love You! If there’s a day that makes me happier than my own birthday, It’s your birthday. You’re the best and the sweetest, you’re the cutest and the closest. Happy birthday to my love! I have a present for you, No one has ever got, Happy birthday my love, I give you my whole heart. 상대방을 향해 진심으로 축하하고 싶은 진심을 전달하는데 도움이 되길 바라요. 북미 생일파티 문화와 초등학교 생일 파티 모습이 궁금하다면 이전 글을 참고하시길요.